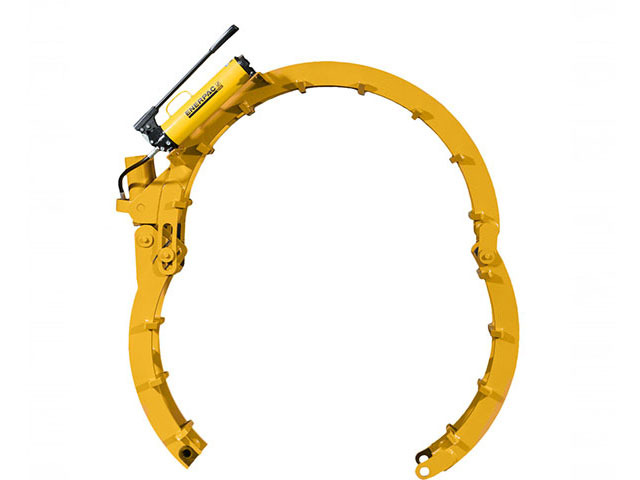 There are times when an average pipeline welding clamp just won’t do, and when those times are calling for the largest clamp on the market, Sawyer’s Segmented Hydraulic Clamp is the hard working pipe clamp that should receive that call. Constructed of quality steel to meet the most rugged of specifications, the heavy duty Segmented Hydraulic Clamp handles pipe-to-pipe fit up jobs on large pipe sizes with ease. This pipeline-proven external lineup clamp is available for pipe sizes 48” and larger. To allow greater flexibility and enhance the handling of large diameter pipe, the heavy duty Segmented Hydraulic Clamp features hinged segments. No other pipeline welding clamp makes such easy work of large diameter pipe tie-in, take up and relay or anomaly digs. Featuring quality steel and double ring construction with relieved webs, this rugged hydraulic pipe clamp is second to none and will stand the test of time as the go-to pipeline welding clamp for large diameter pipe. When you’re in the market for an alignment rim clamp that is also the largest clamp on the market and takes on the toughest jobs with the largest pipe around, look no further than Sawyer’s own heavy duty Segmented Hydraulic Clamp.